Wacky Wednesday’s are back for the summer! Crafts and fun galore for all the community. We said a very sad farewell to Lea Ossenkopp, our intern from Germany who had been with us for ten months and who had been a wonderful additonal pair of hands, willing to do anything asked of her from parents and toddlers, to children’s work, to Reach Shop work and so the list went on… we shall miss her greatly. We are one of six local charities selected by Tesco Stores in the city to receive their surplus food. This is food that no longer matches their stringent display standards but is well within the use by dates. We are receiving both bakery and fruit and vegetables which, in turn, we are making available to the community, either free or through making into meals. Congratulations Tesco on this initiative to reduce their food waste! Sunbeams Music Group team working with some of our young people teaching music and rhythm skills. Lovely letter from parent of Alternative Curriculum pupil thanking staff for all they have done! Alternative Curriculum students recycling wood to make planters. Our Alternative Curriculum students have created this Mosaic of Noah’s Ark for display in our Noah’s Ark Soft Play centre. Haven’t they done well! 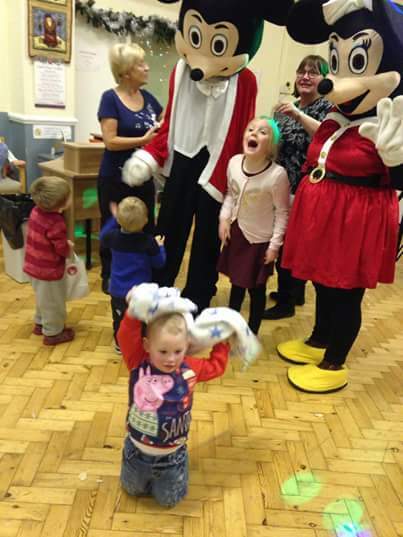 We held a wonderful Easter Party and Disco for the community, a fun time was had by all. On the 27th March we held our Easter Celebration service which was well attended and enjoyed a great time of worship together on this most significant of all days! Our children’s choir were wonderful! On the 18th March we held our traditional Easter Fair which was very well attended. We were able to raise over £600 for our work in the community through this event which well exceeded expectations. All had a good time too which is what it is all about! On the 11th March we held a fundraiser party event for the Smiles Foundation who do important and valuable work in needy communities in Romania. Peppa Pig came to support our event too and we were able to raise over £160 for their work. Thank you to all who came. In February we finalised our Annual Report for the year to 30th September 2015, our third year of operation as this organisation, our 17th full year of work in the west of Carlisle. It doesn’t seem possible that we left our employment to start this work full time so many years ago! Shaun is one of our education students for whom we have found a works experience placement in a local garage. This is a talented young man, very practical, and he is looking to translate his placement into an apprenticeship with them. The young man now and the young man who came to us some two years ago are unrecognisable! We wish him every success as he nears the end of his time with us. Our Family Service at the end of January was special as it included the dedication of two children of one family we have known and worked with for many years including the joy of weddings, dedications and sadly a funeral also. 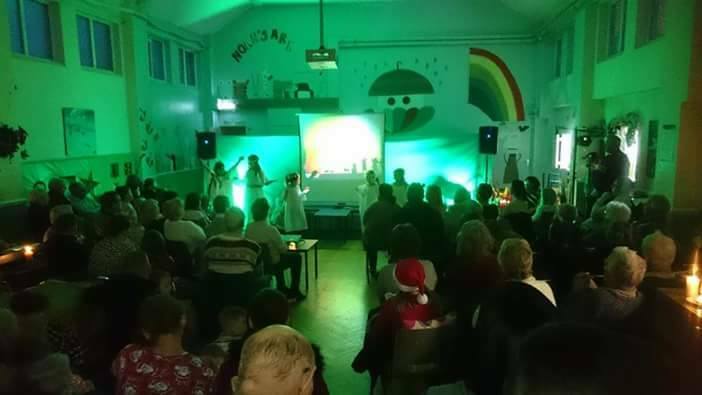 About 85-90 attended our service which helped to create a great atmosphere. We have entered into a new ‘partnership’ with Annie Mawson’s Sunbeams Music Trust. We provide the community contacts and venue and they provide the very talented musicians to work with the children, many of whom appreciate this type of therapy and all of whom thoroughly enjoy the time with them. There is hidden musical talent in these children and we look forward to how it all develops. We were again grateful to the Salvation Army in Carlisle for including us in the distribution of presents in time for Christmas to children in the area who had experienced a difficult year. This was a tremendous boost to us and to the children. However, this was not the only act of generosity this year, for the Tesco stores in Carlisle also included us in their gift run as one of their chosen charities for which we were extremely grateful. The delivery van arrived with what we expected to be a couple of trays of toys and gifts, but one van load was insufficient to bring it all, we have had two delivery vans bringing goods to us! We have been astounded by the volume of goods received and are now planning the most effective and efficient way to distribute all of the items provided. 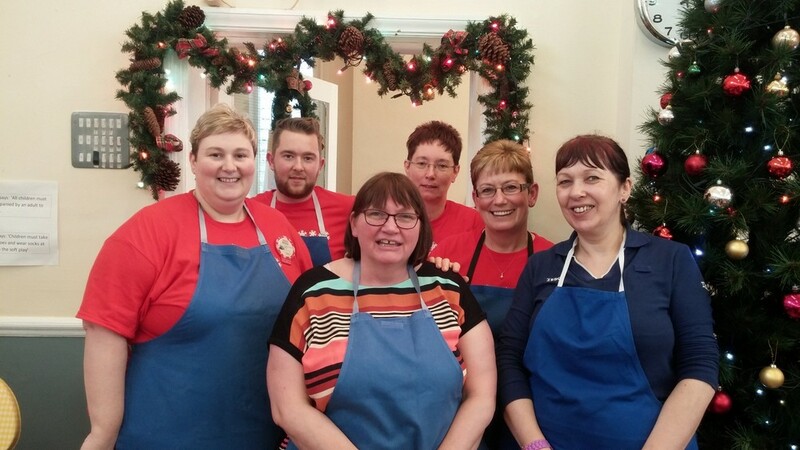 On the 7th December, staff from the two Tesco stores in Carlisle came to our Community Hall to offer their services to provide, prepare and then cook, a full Christmas meal. This was a mammoth effort serving over 80 people, all of whom fully appreciated the occasion and the generosity of Tesco. All we can say is a massive thank you for a great effort! 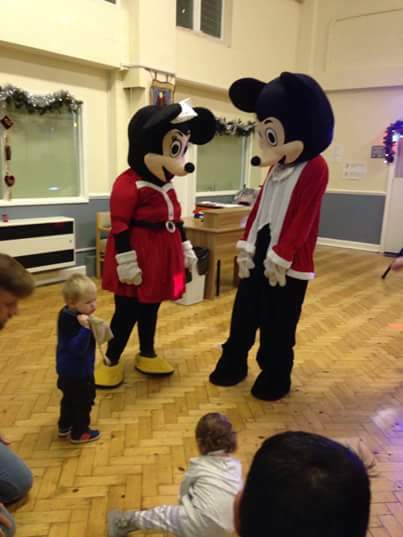 We have lots of events lined up for the festive season. Tickets are available from our community centre.